Whey Protein Isolate Blend (Whey Protein Isolate, Native Whey Protein Isolate), Whey Protein Concentrate, Natural Flavors, 100% Colombian Coffee, Soy Lecithin, Monk Fruit Extract. , use 4-8 fluid ounces of beverage. Whey Protein Isolate Blend (Whey Protein Isolate, Native Whey Protein Isolate), Whey Protein Concentrate, Natural Flavors, Soy Lecithin, Monk Fruit Extract. Did you know the best time to take whey is within 30 minutes of your workout? Based in Denver, Solorado and family owned, Asccent Protein has been purifying proteins for more than 30 years. Those proteins were sold to the leading brands across the world until recently, when we shifted our focus to create the next breakthrough in sports nutrition - Native Fuel. You won't find any artificial flavors, colors, or additives to our products - so you get clean, pure products that you can be confident in. 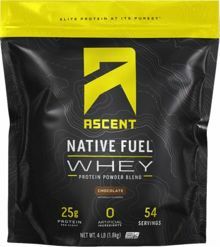 Ascent is gluten free certified and Informed Sport Certified, meaning they're free from any banned substances, so you can be sure that you're getting what you need, and nothing you don't.